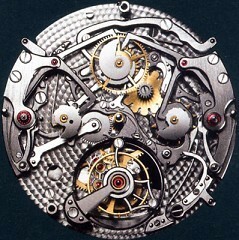 Features: Platinum Toubillon Perpetual Calendar! Bulgari Platinum Sotirio Tourbillon Perpetual Calendar SB43BPLTBPC! INVESTMENT COLLECTIBLE 125th Anniversary!!! 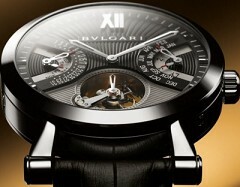 BULGARI's NEW SOTIRIO BULGARI COLLECTION is a Tribute to the 125th anniversary of Bulgari and its founder Sotirio Bulgari! Bvlgari produced many hundreds of 18k Gold either in Rose or White... ONLY 30 were produced in Platinum! This is the last NIB of the ONLY 30 Platinum examples produced! It's now an incredibly RARE collectible! 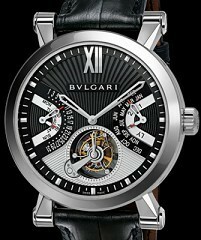 Bulgari was able to recognize the fruits of its vertical integration in the watchmaking sector: having entirely designed, produced and assembled a caliber for the first time in its history. The Group went on to launch the Sotirio Bulgari Tourbillon Quantième Perpétuel in 2009, the first watch with the movement and all components completely produced and assembled in-house. Fully developed by Bulgari, the BVL 465 Caliber comprises an automatic see-through tourbillon and perpetual calendar with an innovative display that features double coaxial retrograde hands, 46 jewel automatic Bvlgari movement.